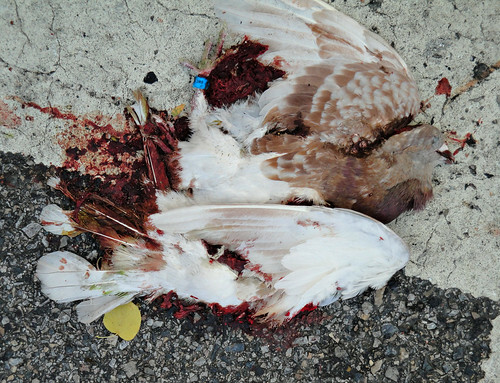 It appears that this pigeon took a blow from the rear from an auto while trying to alight from the pavement. (Image made by me in Baltimore in 2010). I thought that the following article made for interesting reading, in light of the fate that befell the bird in the above image. The article could lead one to speculate on how the pressures of natural selection are changing birds like pigeons and sparrows in an urban environment. Cliff swallows that build nests that dangle precariously from highway overpasses have a lower chance of becoming roadkill than in years past thanks to a shorter wingspan that lets them dodge oncoming traffic. That’s the conclusion of a new study based on 3 decades of data collected on one population of the birds. The results suggest that shorter wingspan has been selected for over this time period because of the evolutionary pressure put on the population by cars. The Browns have studied cliff swallows (Petrochelidon pyrrhonota) in southwestern Nebraska since 1982. They return to the same roads every nesting season to perform detailed surveys of the colonies of thousands of birds that build mud nests on bridges and overpasses in the area. Along with studies on living swallows—counting birds and eggs, netting and banding individuals, and observing behaviors—the Browns also picked up swallow carcasses they found on the roads, in the hopes of having additional specimens to measure and preserve. They hadn’t planned studies on roadkill numbers, but recently they began to get the sense that they were picking up fewer dead birds than in the past. When the researchers looked back at the numbers of swallows collected as roadkill each year, they found that the count had steadily declined from 20 birds a season in 1984 and 1985 to less than five per season for each of the past 5 years. During that same time, the number of nests and birds had more than doubled, and the amount of traffic in the area had remained steady. The birds that were being killed, further analysis revealed, weren’t representative of the rest of the population. On average, they had longer wings. In 2012, for example, the average cliff swallow in the population had a 106-millimeter wingspan, whereas the average swallow killed on the road had a 112-millimeter wingspan. This entry was posted in personal recollections, sciences and tagged evolution photography birds natural selection street by Bill Angel. Bookmark the permalink. Thanks for that interesting info. Here, there’s distress amongst animal lovers, over Sulpher Crested cockatoos and pink and grey galahs, on the highways. The baby galahs are distressingly slow to react into flight, on roads. Just sit, in indecision, I hazard. The cockatoos are such intelligent, long lived birds, it upsets me. It wouldn’t be unthinkable that they did catch on, yet they don’t. Perhaps the seeds/blossoms that drop are too enticing? Then the roos and wallabies, hit on roads. If spotted, as an animal lover, you should check pouches, and I recently pickd up a young wallaby. I SO wish there was some sort of hopeful trend for all these creatures. Wombats and echidnas used to be distressing road kill, but their numbers have dropped so badly, their deaths are less. It’s very sad. Would that mean the chicks leave the nests a few days later, wuth a little more strength or, there is a tiny number of extra 1st flight failures? Tho clearly, the shorter wing seems to be the greater advantage.